Let’s pick back up with the discussion of dominant eye. Much of the time the dominant eye is on the same side as your dominant hand. So, a right hand person is often times right eye dominant and it is the same for left handers. Please note, this is not always the case. In fact, I have two left hand children who are right eye dominant. They both shoot right hand under normal circumstances, but are competent left hand shooters as well. For handguns, this is not so much of an issue as it might be for long guns. In fact, you should strive to be equally competent with either hand. 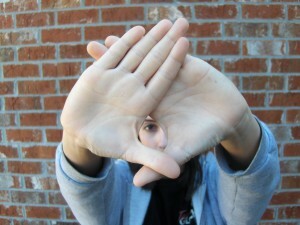 There are several ways you can determine which eye is dominant.One very simple way is to place your hands together creating a hole with your two hands as in the photo.With both eyes open, pick out a spot on the wall or in the distance and center it in the hole you formed with your hands.Now draw your hands back to your eye–voila, that is your dominant eye. An alternative is to simply close one eye at the time with your hands extended. If the spot you picked remains in view when you close your left eye, you are right eye dominant. If the spot is lost from view you are left eye dominant. Once again this is not much of an issue for handguners. 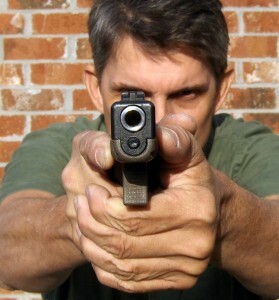 You are going to line up over the dominant eye when shooting left or right handed. If you have any trouble with aiming, you will simply partially or completely close one eye in order to achieve a clear sight picture. Sight picture is simply sight alignment super imposed on the target. Now that you’ve achieved sight picture and knowing that your eye can only focus on one thing at a time. What will you focus on in order to achieve that perfect shot? The rear sight? The front sight? Or the target? If you are like most of my students, you will have chosen to focus on the target. This is the incorrect answer. The correct response is to focus on the front sight, and, more specifically, the top edge of the front sight. This means that the rear sight will be slightly unclear and the target will also be somewhat fuzzy. 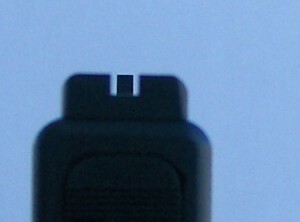 Maintaining the top edge of the front sight in sharp focus is the proven method for achieving the perfect shot. From three feet to 1,000 yards, it’s always a sharply focused front sight that helps us make the perfect shot.